Anaheim is a city widely recognized for being the home of Disneyland, one of the best-known and most visited tourist attractions in the world. 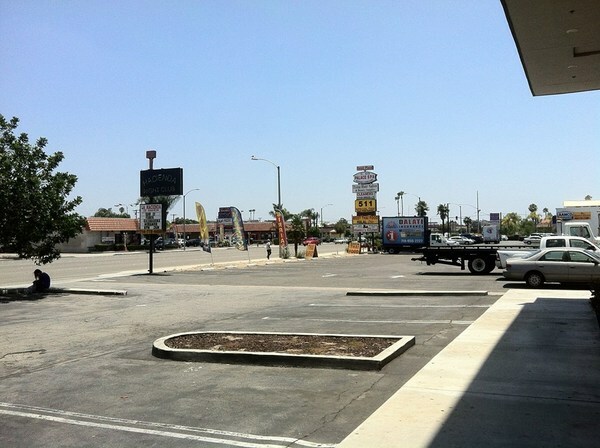 The sprawling city, by area the second largest in Orange County, is also home to many other less-visited places, such as Little Arabia, a locally-beloved and highly visible concentration of Arab businesses that has so far failed to receive formal recognition from the city. Anaheim was founded in 1857 by a group of Bavarian vintners, most of whom had immigrated to Orange County from the Franconia region of Germany. The city’s name was created by combining the words “Ana” (a reference to the Santa Ana River) with “heim” (a German word for “home”). Anaheim was incorporated as a city in 1870. 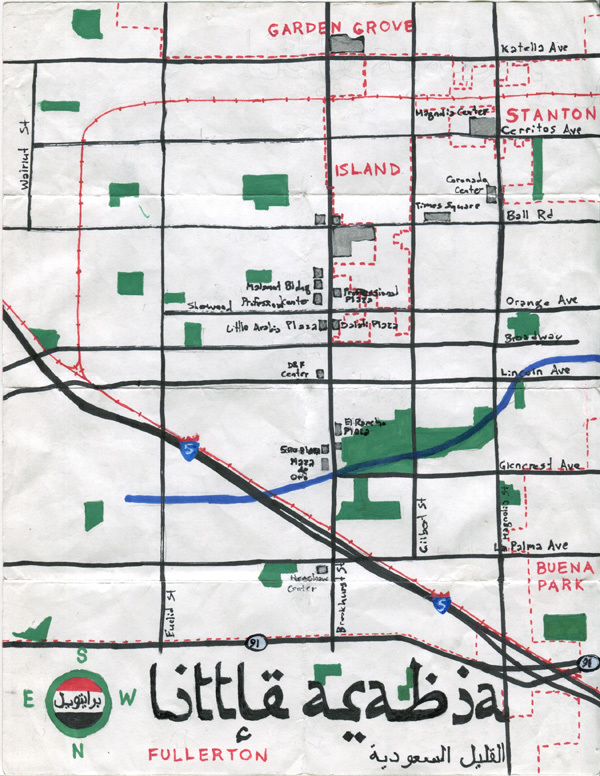 From 1953 to 1955, Anaheim quadrupled its area through a series of annexations. Disneyland opened in 1955, and most of the suburban homes in nearby West Anaheim were built shortly thereafter, on land that had previously been devoted to the production of oranges. 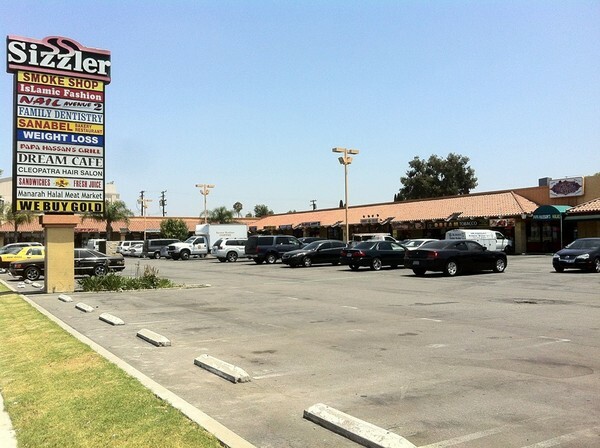 In the latter half of the 20th Century, the working class suburb of one of Orange County’s primary industrial centers gradually went into decline, and became notable for its preponderance of strip clubs, motels, and other businesses decidedly at odds with family-friendly reputation of the city’s best known attraction. 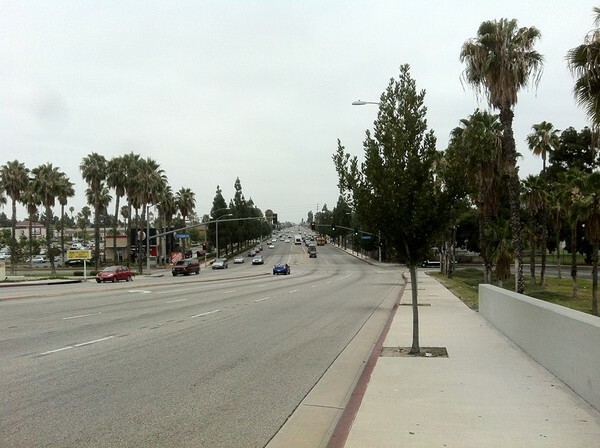 Attracted in part by the cheap rents and ample room for renewal, significant numbers of Arab homebuyers and business people began moving into the area of West Anaheim in the 1980s. In the 1990s, two high profile entrepreneurs, Lebanese Ahmad Alam and Syrian Belal “Bill” Dalati, transformed the neighborhood into an Arabic business district. In 1996, Alam and other Arabs helped establish the Arab American Council. That same year the Arab World Newspaper began publishing from offices in the Alam-owned Brookhurst Plaza, and a Palestinian couple from Nazareth opened Kareem Mediterranean Restaurant, today the oldest-extant Arabic restaurant in the neighborhood. As with the Vietnamese-Americans in Little Saigon and the Korean-Americans in Little Seoul, not everyone was happy with the change. Just as ordinances were later passed to require Vietnamese workers to cover specific parts of their body whilst serving coffee and smoothies, action was taken in 2005 to require Arabic lounges to acquire special permits for belly dancing, live music, and alcohol service. According to the 2010 US Census, there were 1.7 million Americans of Arab descent, although the Arab American Institute estimates that number to be considerably higher — closer to 3.6 million. California is home to the largest population of Arab-Americans, 94% of whom live in urban areas and whose ancestry is traced primarily from (in descending order) Lebanon, Egypt, Syria, Iraq, Palestine, Morocco, and Jordan. Roughly one in four Arab-Americans trace their ancestry to more than one Arab country. Those Arab countries are home to many non-Arabic people too, including Armenians, Aryans, Assyrians, Azeris, Berbers (Imazighen), Chechens, Circassians, Ethiopians, Jews, Kurds, Mhallami, Romani, Samaritans, Shabaks, Turkmen, and Turks, to name just a few. A common fallacy is that all Arab-Americans are Muslim, and that most Muslims are Arabs. In reality, the country with the largest Muslim population is Indonesia, which has a Muslim population that is larger than that of all Arab countries combined. In America, approximately 63% of Arabs are Christian (35% Catholic, 18% Orthodox, 10% Protestant), whereas only 24% are Muslim. 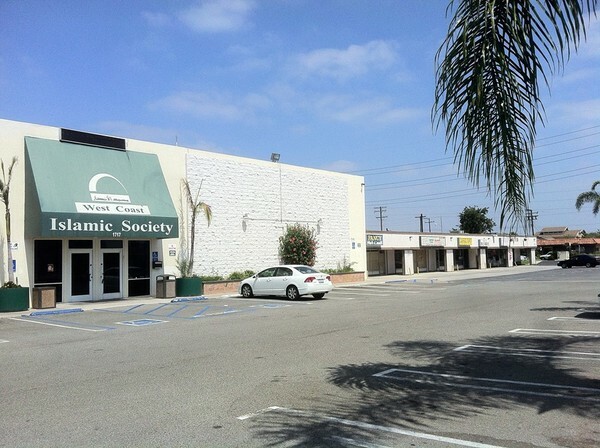 In my exploration, I found only two mosques in Little Arabia: Masjid Al-Ansar — West Coast Islamic Society, and The Islamic Center of Anaheim. By comparison, there were more than twice that many churches on a single block of Ball Road. 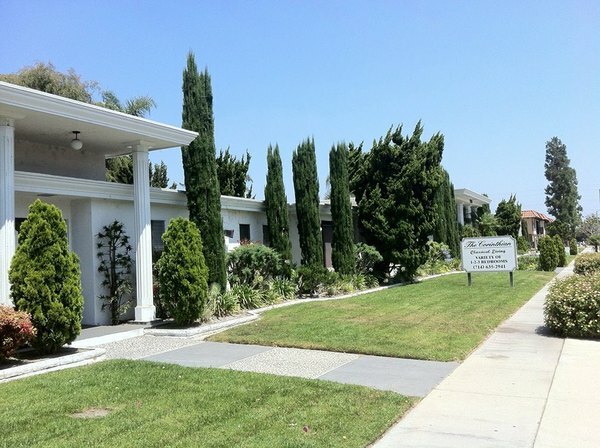 There is at least one Arabic Christian church in the neighborhood too, Christian Arabic Church of Anaheim. The Middle East is, of course, the birthplace of many other non-Christian/non-Islamic religions like Bahá’í, Druze, Gnosticism, Judaism, Mandaeism, Samaratinism, Shabakism, Yarsanism, and Zoroastrianism and there’s little reason to imagine that businesses in Little Arabia aren’t frequented or operated by at least some people of some of those faiths. Indeed, from what I could ascertain, in Little Arabia there is considerable overlap between Arabs with various origins, Arabs of various religions, various other non-Arab Middle Easterners, and people whose recent ancestral origins are not tied to the Middle East at all. 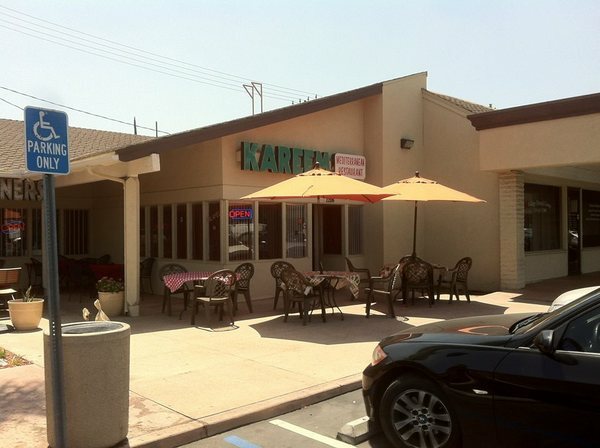 For example, the first businesses that I visited was Hatam, which turned out to be a Persian restaurant and one that was stocked with an Urdu language newspaper published in Placentia, Shohrat International. 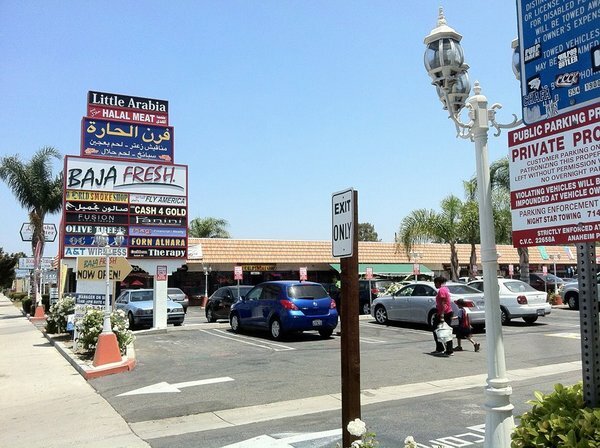 Nearly all of the Arab, Middle Eastern, and Islamic businesses of Little Arabia are located along Brookhurst Street, primarily between Katella Avenue to the south and La Palma Avenue to the north (with some located in neighboring Stanton and Garden Grove). In contrast to nearby Little Saigon and Little Seoul, however, no part of Little Arabia is utterly dominated by Arab businesses. In every strip mall sign with Arab script there are also signs written in English, Spanish, Vietnamese, Lao, or Chinese. The biggest shopping center in the neighborhood is home to just one halal bakery and no other obviously Arab-owned or oriented businesses. Furthermore, there are fairly long stretches of exclusively residential blocks between pockets of Arab businesses and in the north, a nearly half-mile freeway and train overpass further isolates the pocket of Middle Eastern businesses. Should you want to visit Little Arabia, the closest train stations are Buena Park Station, the Fullerton Transportation Center Station, and Anaheim Station — and all located several kilometers away. They’re all served by various Metrolink and Amtrak trains as well as OCTA buses, the extensive network of which covers Little Arabia and all of Orange County beyond. The OCTA 35 bus runs up and down Brookhurst through the heart of Little Arabia and and the neighborhood is also served by OCTA lines 30, 33, 38, 42, 46, and 50. Little Arabia is flat enough to make it physically easy to visit and explore on foot or on bike, but it is currently much more accommodating to automobiles than to human beings. Brookhurst Street is ridiculously wide — nine traffic lanes wide to be exact (two narrow lanes are set aside for bicycles). The vastness and lack of traffic (and many pedestrians or cyclists) seemed to make some drivers that the street is an interstate, and I was very nearly run over in two instances. Unfortunately, I had the horribly distressing experience of observing the final moments of a cat who wasn’t as lucky. Little Arabia is also severely lacking in sufficient shade. It’s always a good idea to wear sunscreen and carry water, but I can see no reason why the paved roads, road verges, sidewalks, and parking lots need to exist as a vast, lifeless expanse of pavement, almost completely uninterrupted by trees, shelters, or any sort of quality-of-life-enhancing streetscaping, except that this is inland North Orange County and that’s how it’s generally done. Thankfully, some of the bus stops have roofs, and pedestrian-friendly zebra crosswalks are finally being installed at some intersections. 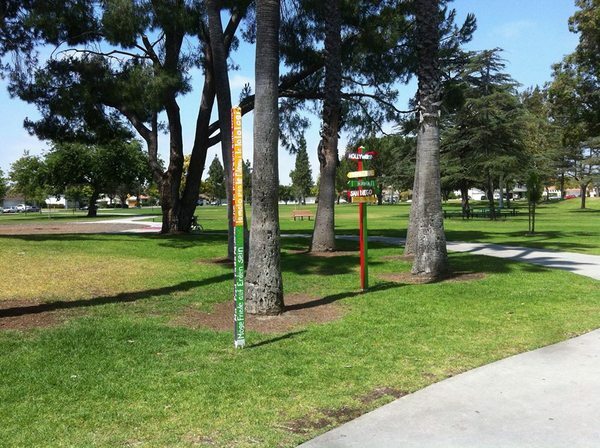 There are, thankfully, oases of green public space spared from pavement, mostly in the form of parks, including Barton Park, Brookhurst Park, Magnolia Park, Maxwell Park, and Modjeska Park, as well as a couple of retarding basins — Gilbert and Crescent. At Modjeska Park I entered the community center, which seemed to be popular with seniors lured by by activities like bridge, karaoke, pinochle, and tai-chi. At Modjeska Park there were a couple of games of softball taking place, also mostly involving seniors whilst a younger set engaged in basketball, bicycling, and (the youngest set) playing on playground equipment. Away from the unaesthetic main drag, the smell of fast food, hookah smoke, and petrichor (those thirsty sidewalks aren’t going to water themselves) gave way to a more pleasant combination of aromas of fig trees, gardenias, jasmine, magnolias, passion flowers, roses, and society garlic — all combining and underscoring just how unhelpful, unhealthy, and unsustainable the Brookhurst streetscape is. 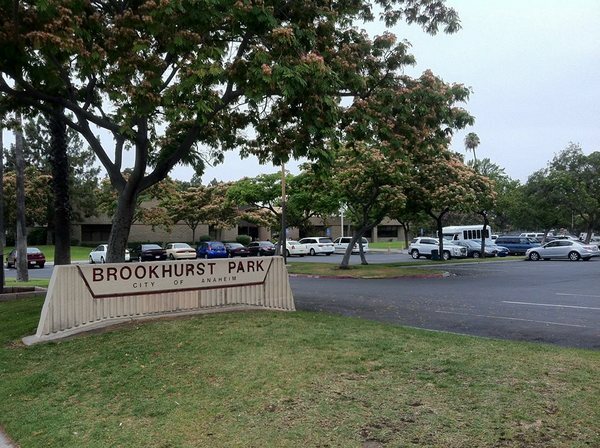 Imagine a Brookhurst lined with and divided by a median landscaped with icons of Arabia — olives, date palms, and cedar trees — and just how much more pleasant the experience could easily be with just a little bit of vision. Maybe my dreams of a human-friendly streetscape will someday come, maybe they won’t. They might, for some, too blatantly advertise the neighborhood’s Arab character (although I suspect that palm trees in Southern California have completely lost their ability to conjure up Arabian fantasies). Many of the business owners seem content, at least for now, with maintaining a somewhat low profile. Women in hijabs are a common sight, and I saw a copy of the Qur’an in the back of a Nissan, but I can’t help but suspect that the pan-Arabic restaurants mostly identify as Mediterranean rather than Middle Eastern out of fear of alienation, or worse. Despite their use of the “Mediterranean” code, most Middle Eastern and non-Middle Eastern visitors to Little Arabia almost certainly come for the food. Arab cuisine is rich in flavors of almonds, bulghur, cheese, cinnamon, cumin, dates, fava beans, figs, garbanzos, garlic, lentils, mint, mulukhiyah, tomatoes, olives, onions, parsley, peanuts, pine nuts, pistachios, pomegranates, rice, saffron, semolina, sesame, spinach, sumac, thyme, turmeric, walnuts, wheat, and yoghurt. Being a fan of all of that, I ate twice — once enjoying a tasty breakfast manakish at Zait & Zaatar, and a few hours later, a tasty lunch at Sahara Falafel. Other neighborhood Middle Eastern and African restaurants include Aleppo’s Kitchen, Alwadee, Ararat Armenian Cuisine, Beiruty Bistro, El Mahroosa, Jasmine Mediterranean Restaurant, King Kabob Express, Merhaba, Midan al Tahrir, Olive Tree, Papa Hassan’s Grill, Tana Ethiopian Restaurant, and Zankou. There are of course non-Arabic restaurants too, especially it seems, Italian (which is never, despite its geography, advertised as “Mediterranean”). I came across Sal’s Bit of Italy and Mama Cozza’s, and after lunching with a friend, he took me to his favorite neighborhood Italian market, Cortina’s, an institution since 1963. There are several bakeries in the Little Arabia, some are like more like delis, whilst others are more like pastry shops. Currently in operation are Al Amir Bakery, Al Sanabel Bakery, Al-Sham, Ara’s Pastry, Arja Pastry, Knafeh Cafe, Kunafa King, and Sarki’s Pastry. 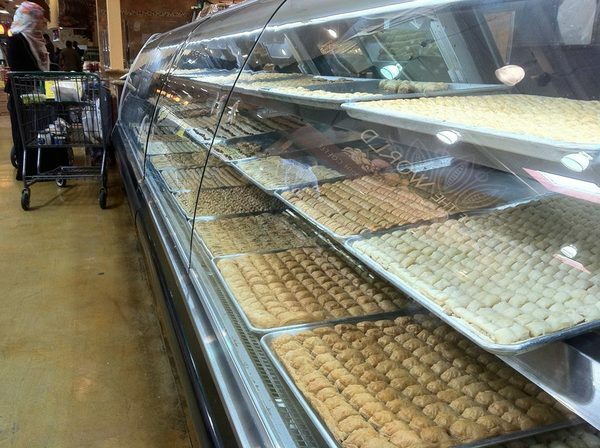 There are non-Middle Eastern bakeries as well, such as the Mexican El Sol Bakery. There are also several halal butcher shops in Little Arabia. For meat-eating omnivores, animals frequently featured on Arabic plates include camels, cows, chickens, fish, goats, and lambs — although I’m not sure which are common locally. There’s also overlap between butcher shops and markets, but businesses primarily oriented toward butchery include Al Huda Deli & Market and Manarah Meat Market. There are at least a couple of Mexican carnicerías in the neighborhood too. The first market I entered was Altayebat Market, which is fairly small but hugely popular, from the look of things. An impressive, diverse group of shoppers surveyed an impressive, diverse produce section which featured Persian, Italian, Chinese, and Indian Eggplants, as well as Mexican Squash and other products with origins around the world. 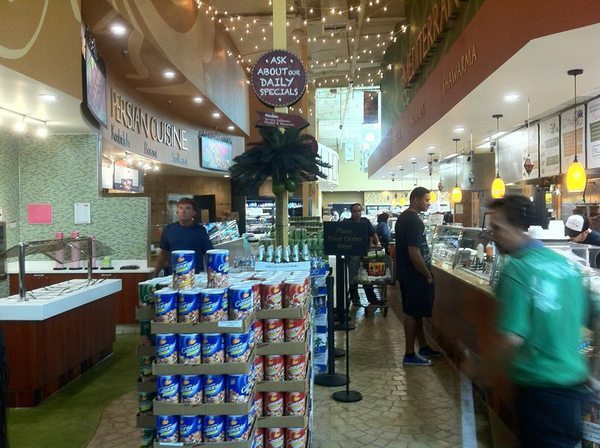 I also visited Fresh Choice Marketplace, a huge supermarket down the road in Garden Grove. As with the nearby Super King (which began in Anaheim in 1993), it was also full of shoppers, albeit of seemingly even more diverse backgrounds. Given these the presence of these impressive Arabic markets, I wondered what concessions a chain like Stater Brothers would offer, if any. I was frankly surprised at how generic its selection was in comparison; even the Sizzler in Little Arabia has a halal menu. To my amusement, the “International Foods” section prominently featured exotic products from far off Boyle Heights (El Pato), exotic Irwindale (Huy Fong), and inscrutable Vernon (Tapatio), as well as actual international brands like Jarritos and Kikkoman. Finally, I also visited the tiny Lao Asia Market, a small market with Laotian and Thai goods located next door to a store trading in Lao CDs and DVDs. Beyond Little Arabia, but not too far away, are more Middle Eastern and Muslim restaurants and cafes such as Al Tannour Mediterranean Cusine, Cafe Feshawi, DonerG Turkish & Mediterranean Grill, Janna Cafe, Jasmine Mediterranean Restaurant, Mas’ Chinese Islamic Restaurant, Mazaj Café, and Special Thai Restaurant. 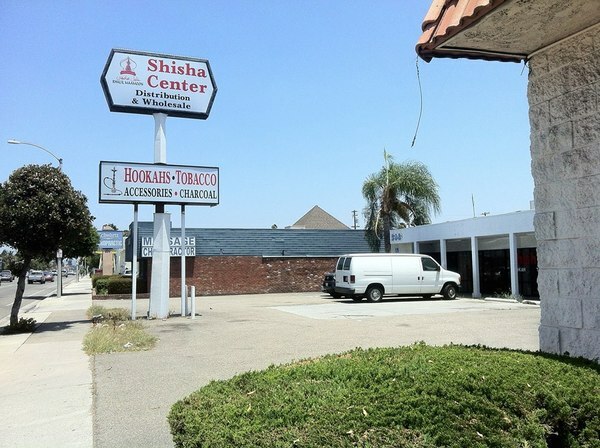 Despite the efforts of the local Anaheim mutaween, there are still many shisha dens in the area. In the Little Arabia neighborhood proper there’s Arabisc Restaurant & Hookah Lounge, Dream Café, Fusion Ultra Lounge, Hidden Café, Janna Cafe, Nara Bistro, Nubia Café, and Rose Café. A little further afield there’s La Capitaine Hookah Lounge, Laziz Cafe and Hookah Bar, Noor Hookah Lounge, Odyssey Hookah Lounge, and Titanium Hookah Lounge. Despite the veiled health concerns, the second hand smoke from the ones that I passed was much less unpleasant than the fumes of the 5 freeway, and I rightfully or wrongfully assume, less unhealthy. Given the concern over vice, it came as more of a surprise at how many non-Arabic houses of ill repute operate with apparent relative impunity. In my explorations of Southern California I have never noticed as impressive a concentration of “gentlemen’s clubs” and dive bars as in Anaheim. Just walking along Brookhurst I noticed Bottoms Up Tavern, California Girls Night Club, Club Unique, the Hacienda Night Club, the Sherwood Inn, a Sugars bikini bar, and the Kopa Room — the latter tucked inside of the lovely Linbrook Bowl and except for the bar itself, a time capsule of 1958 aesthetics. There are, of course, Arabic businesses besides those I’ve mentioned although their appeal is probably limited primarily to Middle Easterners and Arabic speakers. 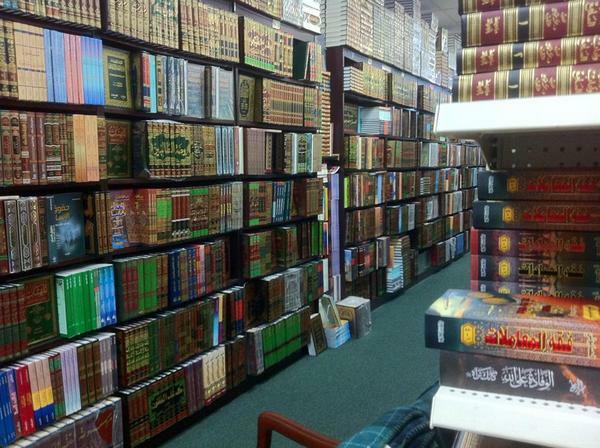 There are bookstores (Dar al Kitab al Arabi and Jarir Book Store), a video store (Alaa-Eldeen Arabic Video), clothing stores (Al-Farah Islamic Fashion, Al-Anwar Islamic Fashion, and Taleen Fashion), jewelers, travel agencies, immigration law offices and many beauty salons. When deciding when to visit Little Arabia, it should be noted that Monday seems to be the day that most are closed. Eid al-Fitr, the breaking of the Ramadan fast, might seem like a good time to visit, this year, as with last (its first), it was held in Downtown Anaheim, not Little Arabia. Similarly, the annual Arab-American Day carnival is held in nearby Garden Grove, not Little Arabia. My visit occurred right after Algeria, the only Arab team in the world cup, qualified for the knockout stage for the first time. In France it was reported that there were extensive post-victory clashes with the police, but the scene in Little Arabia was practically tranquil. I didn’t see any Algerian flags being flown out of either pride or solidarity, although I did spy flags of Brazil, Costa Rica, Mexico, Spain, the USA, and the US Marine Corps, variously flying and flapping from passing cars and flagpoles. There was only one shopping center that I noticed which did feature the flags of any Arab countries. While Little Arabia might not be an exclusively Arabic neighborhood, or one with centuries of history, those have never been requirements for official recognition of any of Southern California‘s existing ethnic enclaves. 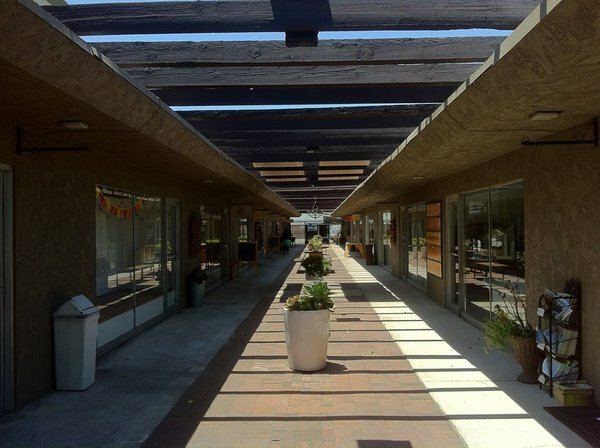 It seems to me that a neighborhood comprised of Spanish-Mission strip malls, Greek-columned apartments promising “classical living,” faux-Polynesian no-tell motels, and schools with ancient Peloponnesian mascots, and in a town crisscrossed with streets with names like Aladdin, Spain, Dallas, and Poona, can surely make room for the aspirational fantasies of both the Middle Eastern and the Middle Western immigrants who pursue their dreams there.